Last week, Joshua Broomberg uploaded a picture of himself and two friends to Facebook. All were wearing Palestinian scarves, and it was accompanied by a message reading “Team South Africa… show our opposition to the human rights violations being carried out against the people of Palestine”. The post caused fury in a segment of the country’s Jewish community, and over the weekend an online petition had been set up demanding he be punished. Broomberg is deputy head boy and head of the debating team at King David Victory Park, a Jewish school in Johannesburg. The petition was posted on Change.org, and called for his removal from “all leadership positions”. It is addressed to the school’s headmaster, Gavin Budd, and Rabbi Craig Kacev, head of the South African Board of Jewish Education, to which the school is affiliated. 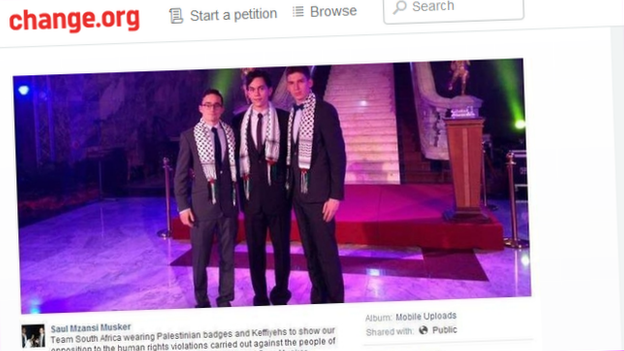 It has attracted more than 2,000 signatures, and a string of comments from Jewish South Africans who were shocked by Broomberg’s post. Soon, however, two rival petitions were created, lobbying the school to stand by Broomberg and his Facebook post. 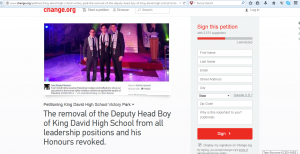 “We oppose the suggested removal of the Deputy Head Boy… and support his leadership & humanitarian qualities,” said one, also on Change.org and created by a user named Rob Hutchinson, from Johannesburg. Another, entitled “Defend Freedom of Expression in the Jewish Community,” was createdon Avaaz.org and the initial signatories say they are all former pupils at King David Victory Park. The opposing petitions have attracted a combined total of more than 7,000 signatures. The reaction to Broomberg’s case seems to reflect a growing debate among South Africa’s Jewish population, estimated to be around 70,000 strong. On Monday, around 500 members of the community marched in Durban to protest against Israel’s actions in Gaza. They reportedly sought to distance themselves from local Jewish organisations that showed “blind support” for the military campaign. Broomberg himself has now responded, taking to Facebook to defend his message. “While I apologise for the hurt we seem to have caused, I do not apologise for standing with Palestine on this issue,” he wrote. For his part, the South African Board of Jewish Education’s Rabbi Kacev has dismissed all three of the online campaigns. Speaking to BBC Trending, he explained that the school teaches children about the centrality of the state of Israel, adding: “For many that’s a political statement, but for us it isn’t. We’re not a political organisation”.